Life is generally absurd. 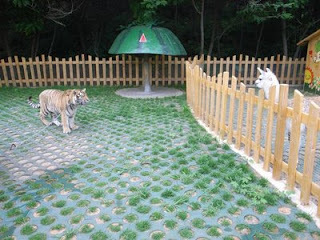 So I thought I'd post this picture of a couple of Dalian Forest Zoo neighbours sharing a picket fence: a Siberian Tiger and a Llama. Last October, I visited the third largest city in Russia's Far East, Komsomolsk-na-Amur, where if you wander outside the city borders, you could get attacked by one of these giant cats, as they are still about, untethered, hunting in Siberia.